At the moment we are rearing our own caterpillars watching them as they evolve and learning all about the exiting life cycle that see's them become beautiful butterflies. We are only a few days in and our caterpillars are growing quick! It is such a fun activity to take part in with the kids and thanks to Interplay UK one of you lucky readers can win one kit of your own. 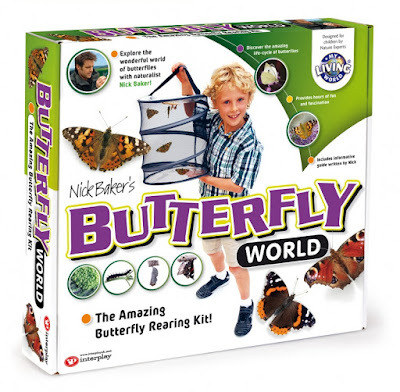 Butterfly World is a hands-on nature study kit containing all the equipment and information required to successfully raise butterflies from caterpillars. Nick's guide is full of fascinating information and tips on how to find caterpillars in the wild and care for them in the rearing cage. To enter the competition, simply follow the instructions on the Rafflecopter form below. Please note that caterpillars are not included. There are instructions on how to find them in the wild or you can order them via the form included in the kit. Open to UK only. The competition will end 12/06/2016 at midnight. All entrants must complete the mandatory entry on the rafflecopter form. Those who don't will have all entries removed. All winning entries will be verified to ensure the entry has been completed correctly. The blog owner will choose the winner through the rafflecopter form (which uses random.org) The winner will be notified by email and displayed on the widget. One winner will receive one Butterfly world kit. Caterpillars not included. No alternative prize will be offered. Allow up to 28 days for delivery.